I want to purchase a dvd duplicator tower. With this I can make several dvd's at 1 time. I have to burn in a while +/- 180 dual layer dvd's and after that about 50 normal cd's and dvd's. I saw on ebay an Acard sata controller with 11 lite-on burners and 1 master slave. You have also this card with 11 pioneers or samsung burners. I think I will go for lite-on. (the cheapest of the 3) But what if 1 or more burners are "worn" after a while. Can I simply replace it with the same brand? Can I pull out that dvd burner and just replace it? Does someone here has experience with this? I have a 3-drive version of this (I think it's 4... maybe 3). Other than that, it's the same as you describe. 3 discs? Where's the time saving? Simple, you can do other things while it does the work, your computer is still usable. In hindsight, I would've got more drives - maybe in future I will add another 3. There is also a hard disk for DVD images, which is a huge time saving (rather than ingesting a master each time you burn). The Lite-on drives did not work for me. Awful. 75% of discs were rejected, yet these were high quality TDK DVD-Rs I'd been buying for years. I tried really, really expensive JVC DVD-R discs, (£45 for 100!) and no difference. Firmware was updated, no idea what the problem was. In desperation, I replaced all the Lite-on drives with LG drives, and the problem went away. All good now, never a problem. I am going to rebuild it at some point with 6 drives (I think that's how many ports there are on the Acard board). I read a warning somewhere that the drives should all be identical, one person even said they should ideally be from the same batch. I've no idea how true this is. For your future proofing, maybe buy 2-3 "spares" at the same time so you can quickly swap them in, just in case you get a failure. Love it and have burned hundreds of DVDs with it. Not a single coaster. My review is the video one on Amazon. Just bought the 11 disc duplicator with lite-on drives before I read your message. I also use the expensive JVC/taiyo yuden dvd's. I hope I have more luck. I have 28 days to send back if it doesn't work correctly. many thanks for your reply. Is it easy to replace a drive with sata? So dual layer doesn't work for you but maybe a problem with the burners or media or the duplicate controller? The others experience this to with dual layer? It is much better to replicate from DDP files rather than using burned media as the source, especially on DVD-9 projects. Avoid replicators who only accept burned media. Make sure your layer break is set to "non-seamless" -- there is no such thing as a seamless layer break in DVD. That setting is guaranteed to cause problems at the replicator. Normally I will receive my acard duplicator by the end of next week. I hope it works out for me. The other persons herer are very happy with their duplicators. But did they ever copied a dual layer dvd? I've got one of these 1 to 7 duplicators SuperMediaStore 1 to 7 DVD Duplicator (Economic Line) built-in Asus 24X Burner, Black Casing - Retail | SuperMediaStore.com that I got when it was on a super deal. I paid $225 for it and thought what the heck, if it works great, if not I'm not throwing away a lot of money. Well, it actually works great. I've burned over 2000 discs about 30% of those are dual layers. For single layer discs I haven't had any problems. For DL's if you use really cheap discs you will run into problems. I use the TY's for most single layer and Verbatim for DL's I just did a 50 disc run of DL's with zero coasters. With your answer I'm going to sleep better tonight. I also use Taiyo yuden for single DVD and verbatim for dual layer. Probably cheap discs will cause problems in dual layer. But if you copy a dual layer disc -> do you have to set the layer break? Or is this automaticly? Tom, how long will the film be that you plan to burn onto the dual layer? Are you not able to just compress it at a decent quality to fit onto a regular dvd? I see you got a 11(!) 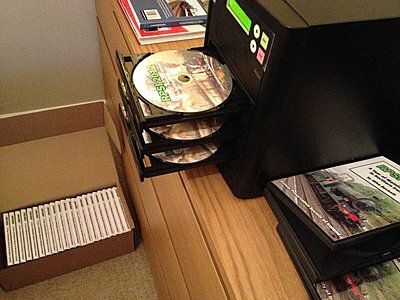 dvd duplicator, that's a lot :) I have one that can do only 3 at a time, mine has a build in harddisc which should minimize writing errors, I have a few jobs that require 100 to 150 dvd's each and my duplicator is sufficient for that amount. A tower with 11 however would only be useful if you need to supply large amounts on a regular basis and in a short period, otherwise I would find it a bit overkill. You'd have to set the layer break. I wouldn't let any program automatically set it form me. I generally pick a spot where there is black and no sound. I also typically set it so there is a seamless break. That sends a code to the player where the next sector is so it can jump to it without any pauses. I would create a disc and play it through completely before starting the run. In theory it should not make a difference whether you make your duplicates from a DVD disc or from an image you create and save on an internal HD. I burn all of my copies from a physical DVD that I've viewed. I have never had problem with the duplicator reading fast enough. Write speeds for any disc writing mechanism will always be slower than reliable read speeds. The advantage I could see for having an internal HD is that I could load up several images that could be written in a batch job. For that I'd like to also have network capabilities so that I could send the images straight from my computer. Mine can be connected to my pc so you can copy the image directly between pc and duplicator. my movie is 240 minutes so must be dual layer. I have to burn about 180 dual layer dvd's for this project! Garrett, about the layer break. I use tmpgenc authoring works 5. I read some info about it online and it seems to do a very good job for setting automatically the dual layer break. So if my master dual layer dvd created and bured with tmpegenc plays fine I can use this one to duplicate? So just copy it in duplicator? I also read that in imgburn you can set the layer break manually.